White Island Lighthouse Station is an icon of New Hampshire’s Maritime History and an Active Aide to Navigation for 200 years!!! The Keeper'sCottage at White Island Lighthouse. White Island Lighthouse Station is a historical landmark from New England's past and a pillar of light protecting northeastern mariners. It's also New Hampshire's only offshore lighthouse. Did you know that this magnificent white brick tower has recently been repaired, but the lighthouse station is still in grave danger? Lighthouse Kids Incorporated is a group of Seacoast New Hampshire students, alumni, interested members of the community and the organization's Board of Directors. Together we share a mission to save and maintain the White Island Lighthouse Station at the Isles of Shoals through service learning projects and volunteer efforts. 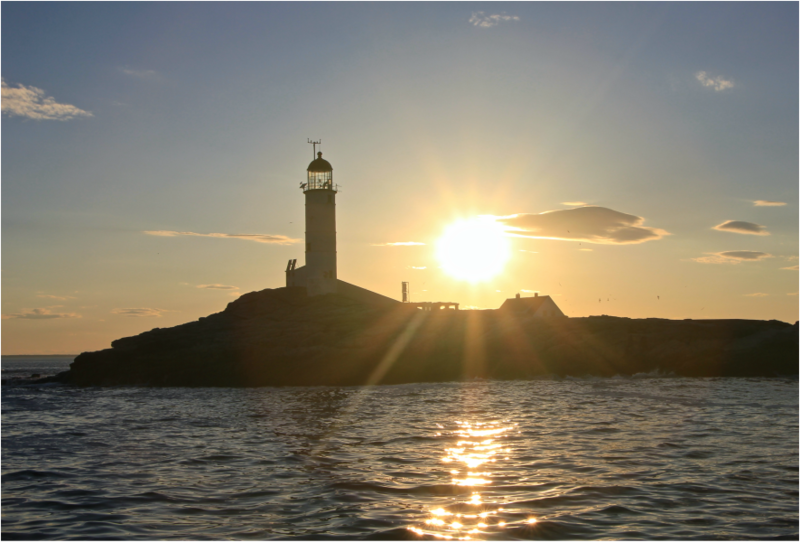 The goal of Lighthouse Kids' is to return White Island in Rye, N.H. to the majestic beauty it was known for at the turn of the 19th century. We plan to do this by fundraising, raising awareness and creating partnerships with all parties interested in saving and maintaining White Island Light Station. Lighthouse Kids strives to increase opportunities for the public to participate in White Island Lighthouse preservation and to expand public access, enabling all to experience the wonder of the island. We would like to see White Island Station's blessings secured for future generations. 2012 steward Marg Whedan photographed the lighthouse as a storm approached. The Coast Guard stopped manning White Island Lighthouse Station in the 1980s and now the State of N.H. has given Lighthouse Kids the task of preserving it. 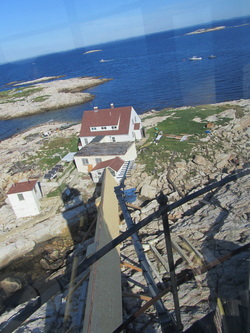 Storm damage and the lack of a caretaking presence have left their mark, so Lighthouse Kids started a stewardship program where volunteers live on the island for brief periods over the summer while working to repair and restore the lighthouse and keeper’s cottage. Following the Smuttynose Island model, we now place stewards on the island for several days to a week or so. Stewardship is not for everyone. To say the least, living conditions on the island are rustic, but also beautiful. Life there is isolated and spartan, but the views are spectacular. Stewards are responsible for protecting the historic/natural beauty of the island, acting as hosts to visitors and depending on ability, performing maintenance tasks such as, cleaning mowing, carpentry and painting. The 2019 White Island Stewardship Program is scheduled to begin in May. If you would like more information contact Sue Reynolds at 603-978-2097 or uncleoscar@comcast.net or check out our Stewardship page by clicking here. Have you even wanted to see the Isles of Shoals? Now's your chance. Lighthouse Kids is hosting its annual boat cruise around the islands to benefit our efforts to preserve the White Island Lighthouse Station. This is a fun, casual event that will include raffles, food, beautiful scenery and more. We will be taking the motor vessel Granite State, well known for its whale watches from Rye Harbor, departing at 5:30 p.m. on Friday, May 31st. The 2-and-a-half-hour trip includes a narrated tour about the marine life, legends, and history of the islands, with a special focus on White Island. We will dock at Star Island for a short walking tour. The cost is $35 per person and includes hors d'oevres. There will be a cash bar with wine and beer.